Providing you the best range of bio - herb (liquid & powder) veterinary medicine, bio - cal (liquid & powder) veterinary medicine, mir - e - mune veterinary medicine, vit mir injections, bio - lox veterinary medicine and cipro - mir - fs veterinary medicine with effective & timely delivery. Liquid : 1 ml. / litre of water 5 - 7 days (or) as advised by a veterinarian. Elemental Calcium : 5000 mg.
Elemental Phosphorus : 1800 mg.
Vitamin B12 : 500 mcg. Citric acid : 20000 mg. Breeders : 20 ml (or) as advised by a veterinarian. 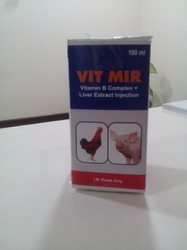 VIT MIR Injections offered comprises vitamin B complex + liver extract injections and is available in 100ml packaging. Prophylactic 20 - 40 mg / kg. 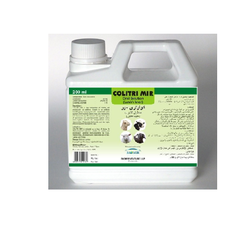 For the control and treatment of severe respiratory infection, Mycoplasmosis, Clostridium Infection, Staphylococcus and Streptococcus Infection. We are offering MIR SCOUR NIL. 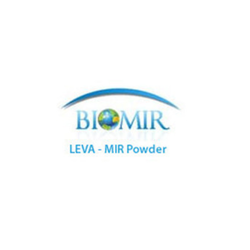 Looking for Biomir Veterinary Medicine ?